The results from my reader survey are in and the number one request is for more articles on dog training. So, let’s get started! 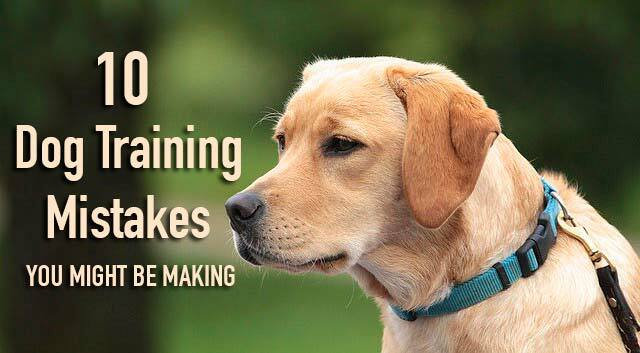 How many of these common dog training mistakes are you making? No worries if you’re guilty of a few of these. I’ve made plenty of mistakes too, just ask Haley! This is a brief list but I’ll be expanding on some of these topics throughout the year. 1. You’re not training consistently. Training your dog takes a certain level of commitment. We all have busy schedules but putting in the work now will pay off in dividends later when you have a well-behaved dog you can be proud of. Set aside time each day to work on training and find ways to work commands into your daily routine. For example, ask your dog to sit before getting her meal or going outside. Practice the down command before she gets a toy. 2. Your rewards aren’t exciting enough. Make sure you’re using high-value, tasty treats or real food and lots of verbal praise when your dog follows a command. It’s best to train when your dog’s hungry, as they’ll be more enticed and motivated to work for food. 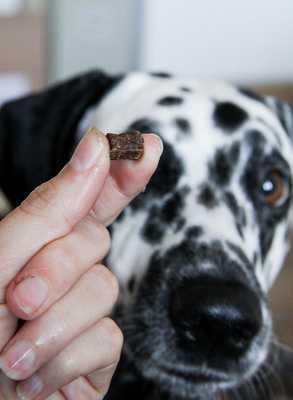 Check out these tips if your dog doesn’t work very hard for treats. If your pooch is motivated by toys and playtime, use those as motivation while training. Use whatever your dog loves! 3. Your dog has too much energy. If a dog hasn’t been exercised or has pent-up energy, it’s almost impossible for them to stay focused on training. Try working with them after a short walk or play session. 4. Your commands are confusing. Use short cues or commands and avoid throwing in extra words with the commands. Make sure you (and all family members) use the same command and speak them clearly and with confidence. It’s also important not to repeat commands over and over again, sounding like a broken record. Since dogs are better at reading our body language than interpreting our words, consider associating a hand signal along with certain commands, like pointing to the floor when giving the down command. 5. You’re not in the right frame of mind when training. Attitude is everything, right? If you’re tired or irritated when working with your dog, your training session might not be very productive. Training can be frustrating at times, especially when training certain behaviors like loose leash walking. If it’s not going well, stop and try again later. Dogs are good at sensing our emotions too, so try to make each training session a positive experience for your pup. 6. Your timing is off. It’s important to anticipate your dog’s next move so you can be ready to reward her as soon as she performs the desired behavior. Dogs associate the reward with what’s happening at the moment or just before receiving a reward. 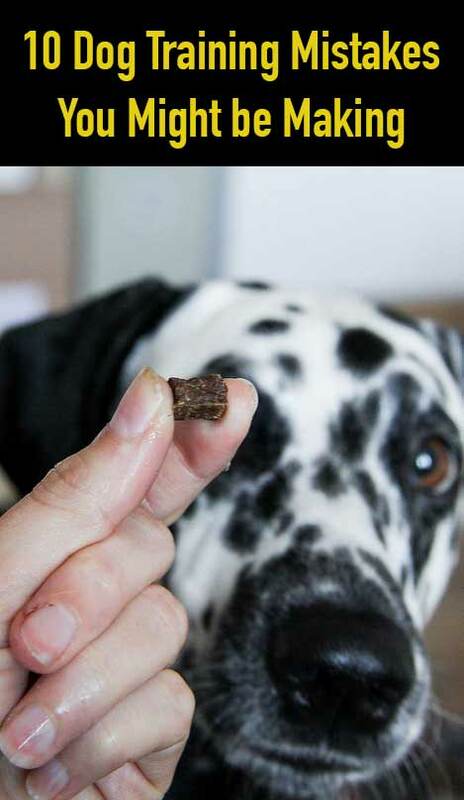 If you’re late in offering the reward, you could be accidentally rewarding the wrong behavior or your dog won’t make the connection with the command. Timing is especially critical if you’re using a clicker to mark a specific behavior. Always end each training session after your dog has achieved some level of success. 7. You’re not using the right tone of voice. Dogs respond to the excitement and enthusiasm in our voice. Too little excitement or a low, monotone voice might not provoke much enthusiasm back from your dog. On the flip side, too much high-pitched excitement or squealing may cause your dog to lose focus. Shoot for a happy, upbeat tone that’s not too over the top and remember that raising your voice or yelling at your dog is counterproductive. For more tips, read How Our Tone of Voice Affects Dogs. 8. You’re moving along too fast. Once your dog understands a command, that’s just the beginning. Next, you need to reinforce the command by using it in different situations and slowly working around higher levels of distraction. Also, teaching your dog too many different commands at the same time can be confusing to them. Take your time and allow them to build confidence and success with each command. 9. You’re using a one-size-fits-all training method. I’m a big believer in positive-reinforcement training because it works so well, but it’s also important to consider the specific personality, breed, age, preferences and history of your dog. Every dog is a little bit different and the key to training success is to discover what motivates your dog to learn while maintaining a positive training environment. When I run into a training roadblock, I try to view the situation from Haley’s perspective and frame of mind. I almost always gain some helpful insight to resolve the issue. 10. Your dog doesn’t trust you. That might be a tough one to accept but it happens sometimes and it’s hard to train a dog when you don’t have their trust and respect. Some people run into this issue after they’ve adopted a dog that’s been abused by a previous owner. If you take the time to establish a relationship of trust with your dog, training will be much easier. If you’ve made some of these mistakes, don’t worry, we all have. I’m guilty of not following through with training Haley around distractions and I remember how frustrated I was while trying to teach her not to pull on the leash while walking. That’s a tough one! Dog training comes easily to some people, they seem to have a rapport with canines and an intuition about their behavior. If you’re not one of those dog owners, don’t worry. 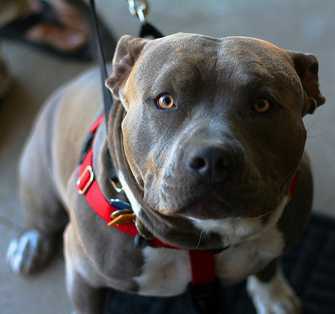 You can enroll in an obedience class or hire a trainer to help you at home. If you would rather get your tips from a book, I highly recommend My Smart Puppy by Brian Kilcommons and Sarah Wilson. It’s perfect if you’re looking for a simple, straight-forward approach to training your pup and building your training experience and confidence. I hope these ten tips make your training sessions more productive and pleasant for both you and your dog. Have you made any training mistakes? Share your tips and lessons learned in the comment section below! Great list. Training is an ongoing process. It seems like we are always working on something new or brushing up on something old. As long as it is fun, we do pretty well. I can tell you really enjoy the training, nosework and photo sessions, Emma. Kudos to Mom for always making it fun!? No problem, JoAnn! I always learn a lot from your shared wisdom too. I know Dante and Ziva work better after they’ve been exercised, and training consistently has definitely been a recent issue of ours. But we’re getting back into it! That’s the great thing, it’s never too late to train and pick it back up, right? It makes you wonder how that adage about old dogs and new tricks ever got started, lol! These are all wonderful tips. I especially love #9. It’s so important to remember that there’s no single approach that works for all dogs. You’re so right, Shanna. I think that’s why some people struggle with certain dogs. They assume they all respond to the same method of training. Thanks for stopping by! ? Great tips! I’ve made a lot of these mistakes. Sometimes what I have just isn’t high value enough for training and Walter and Shermie are just not interested… and my timing can be super OFF too. I have to laugh at how I used to wave a treat right in front of Haley’s nose when she was overexcited and reacting to another dog. She was totally oblivious. Then after things settled down, she’d look at me like “You still got that treat?” Nope! ? What a great list! I know I’ve broken more rules than met them, so this year’s focus will be on doing it right. We’ve got plenty of things to work on around here too. Get ready, pups! Lol ? Having Rita being your best trained dog is awesome! You gotta be doing something right and she seems like a very happy and lucky girl.? I love it that you included frame of mind in this list. It’s so, so important to have positive energy in a training session, and it’s so, so easy to lose it when a session isn’t going quite as planned. It took me the longest time to learn that it makes more sense to simply stop a training session if I was getting frustrated, rather than pushing through. I wish I’d learned that earlier. Oh me too, Jean! I had a lot of frustrating times with Haley when she was a pup. Several times, I remember heading out for a walk with her and turning around 50 feet down the street. I hope you’re doing okay and recovering well. Hang in there!? Mistakes make the perfection. But the word will not work properly with your dog. Some dogs are the really quick learner and can understand any command within just 5 or 6 repetitions. Dog training is not an easy job. We have to be more careful about this matter. Mistakes can delay the process. Thank you very much. 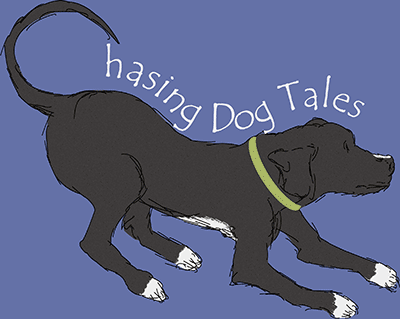 You have highlighted the most common mistakes that are usually done by the dog owners and dog trainers. Consistency is my biggest problem. Luckily Luke seems to be pretty OK with that. If I slack off for a bit, he seems to have no trouble picking right up where we left off after just a quick refresher. I always incorporate hand signals into my training….Luke actually seems to respond far better to those than to words! We have been noticing out dog keeps trying to move into being dominant. If we don’t make sure he sits before going out the door, and has permission to go out, etc. then all kinds of problems get set off. Those are great ways to reinforce listening and prevent pushiness.👍 It’s funny you brought this up now because every year Haley gets pushy in the springtime. It’s like she’s going through doggie spring fever or something, haha! Each spring we have a short period of reinforcing manners. Hiya, Thanks for such an informative blog post. So I recently became the mother of an 8 week old puppy retriever. He is great however there are a few things that need to be ironed out before it gets out of hand. A few of the things you mentioned here, really describes his behaviour. I would take up a professional for the help but they always seem overpriced and really expensive. I recently read a blog post about an online training course that seemed really genuine:https://www.retrieversareus.com/brain-training-for-dogs-review. But Im not sure it is and I wanted an experts advice on wether I should explore this avenue first before throwing cash into professional assistance. Would really appreciate any help you can provide as its now something that I need to take action on. Thank in advance!